C.T. (Tom) Beckmon, age 19, left, and Shelby Meadows, right, in a buggy pulled by a pair of C.T. 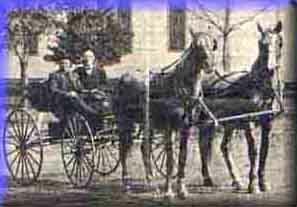 's horses in King City, Missouri in 1907. Ona and C.T. Beckmon on the farm in Clay Center, Nebraska. C.T. Beckmon, Sheriff of Weld County, Colorado, and one of his horses in 1945. John Clayton Beckmon riding Silver, one of his father's horses, in October of 1945. Tim Beckmon, age 2, with his grandfather, C.T. Beckmon, and Trigger in 1951. Lucille Beckmon, then and now, riding Silver, left, in 1945, Paloma, center, in 1995 and Chance's Nellie Grey at Christmas, 1997. Polly Beckmon with the mustang "Boomer." Tim Beckmon with Chief Victory, riding Twilight's Wonder Girl, and with Dominic and Ryan.